Dreams aren’t always what they seem. After collapsing at her birthday party, Genevieve finds her mind drifting like a dream, yet it feels different, beyond slumber somehow. Soon, with all her senses acutely aware, she is living the pivotal choices of her lifetime, but with one extraordinary difference. She now finds herself also experiencing “the other choice” as well. But why? Is there a reason for it all? A spiritual guidance trying to tell her something she needs to know? Helpless to stop the emotional roller-coaster, Genevieve finds both ecstasy and hell in the alternate realities she seems destined to experience. Then, the phenomenal odyssey ends. As Genevieve opens her eyes, she notices her loved ones from the party, surrounding her, happy to see she’s awake. But as objects and people come into focus Genevieve realizes things aren’t the same anymore. In this compelling, fictional tale, that embraces emotions of love, fear, hope and loss, author, Sheryl M. Frazer weaves one choice versus another into a dramatic telling of shifting realities and unexpected twists. Submerge yourself in Genevieve’s incredible journey and see why her reflections are not what you might assume! Get Crossroads Through Time on Amazon! Touches the heart, then firmly takes hold! Don’t miss this one! 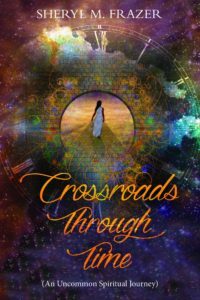 Crossroads Through Time is a dreamy twist of turns, consequences, and the dynamics thereof, a rippling through the fabric of our universe, because of—choices. And does it deliver! Powerfully descriptive with characters I fell in love with, seemingly over a real, put-me-right-in-there lifetime, and then…well I won’t spoil it. But I will say there’s a payoff that’ll wring your mind. Wait for it, really. Journey deep into the wormhole of consciousness, from the depths of Genevieve’s soul to the bottom of her heart. Soulmates, her life with Teddy, and a lifetime brimming with lessons and tribulations, love and appreciation, decisions and consequences. A novel I will likely read again in the future. Especially, one very special part, which is so deep I think I absolutely must read it again! 5 stars for a colorful, otherworldly, shower of introspection on a level that touches the heart, then firmly takes hold. An emotional journey of passion and heartache, and realization to the next degree. Mind officially blown! I am looking forward to more from this author. Read Travis Borne’s review of Sheryl M Frazer’s Crossroads Through Time on Amazon!